Heat oven to 300°F. Spray 9-inch springform pan with cooking spray. Sprinkle wafer crumbs on bottom of pan; set aside. In medium bowl, beat yogurt and cream cheese with electric mixer on medium speed until smooth. Add sugar, flour, milk, vanilla and egg whites. Beat about 2 minutes or until smooth. In small bowl, reserve 1 cup batter. Carefully spoon and spread remaining batter over crumbs in pan. Add cocoa and chocolate extract to reserved batter; stir until blended. Drop chocolate batter by spoonfuls onto batter in pan. To swirl, cut through batter with metal spatula or knife in one continuous motion (be careful not to touch bottom of pan); turn pan 1/4 turn and repeat. Bake 1 hour. Turn off oven; leave cheesecake in oven with door closed 30 minutes longer. Remove from oven; cool in pan on wire rack away from drafts 15 minutes. Without releasing or removing side of pan, run metal spatula carefully along side of cheesecake to loosen. Cover and refrigerate at least 3 hours. Meanwhile, make Raspberry Sauce. Add enough water to reserved syrup to make 1 1/4 cups. In 2-quart saucepan, mix sugar and cornstarch until smooth. Stir in syrup mixture and raspberries. Heat to boiling over medium heat, stirring frequently. Boil and stir 1 minute; remove from heat. Into bowl, strain sauce through strainer to remove seeds. Refrigerate; serve with cheesecake. 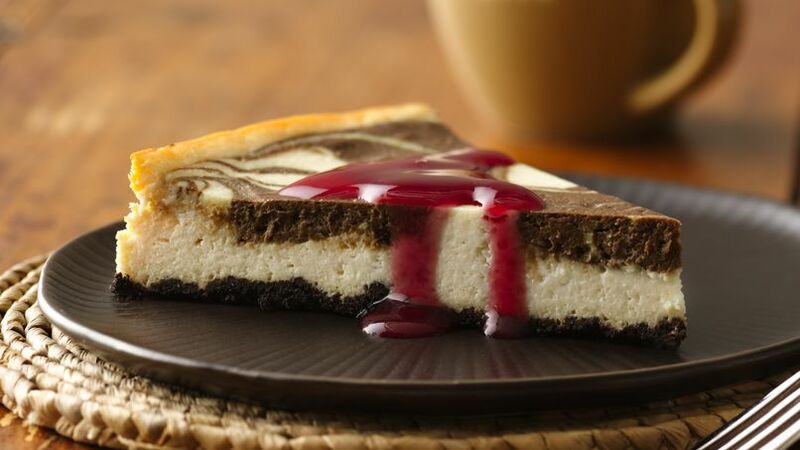 Treat your family to these chocolate swirl cheesecakes that are served with raspberry sauce and made using yogurt - a wonderful dessert.